Take the retro charm of the classic Batman series, combine it with a ton of features courtesy of software developer Playtech, throw in four progressive jackpots, and what have you got? 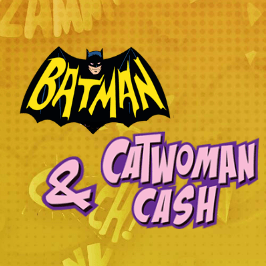 The Batman and Catwoman Cash slot game. 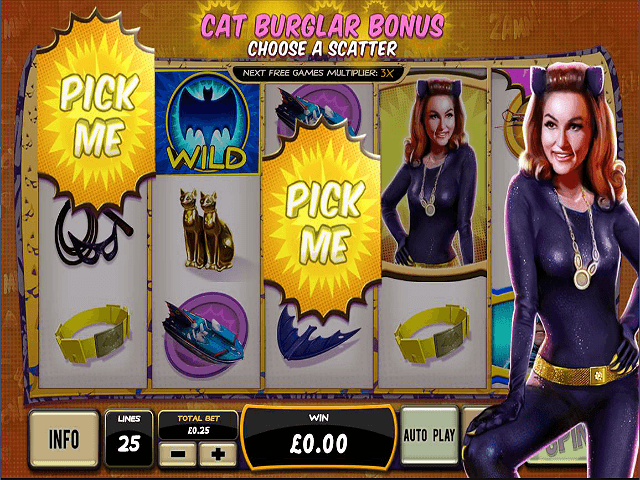 Regardless of whether you're into stunning graphics, free spins or bundles of bonuses, the Batman and Catwoman Cash online slot game literally has something for everyone. Of course, we know you probably need a little more convincing than this, which is why we've compiled the Batman and Catwoman Cash slot review for your reading pleasure. Play Batman and Catwoman Cash for Real Money! The first thing to note about this jackpot slot is it’s homage to the uber-successful retro Batman series. Based on the original TV show and featuring iconic characters like Catwoman, The Penguin and The Riddler, the classic design of this game is one that really stands out. Indeed, if you're a fan of Batman and Catwoman Cash slots, the entire series is one that will bring back memories of the world-renowned show. Once you've taken a trip down memory lane with all your favourite characters, it's time to take a spin. With five reels and twenty five win lines in play, this online slot has plenty of ways for you to secure that cash prize. To set the reels in motion you'll need to move the bet counter between the minimum (£0.25) and the maximum (£500). Once you've done this, the spin or autospin (set to the number of automatic spins you want) will bring the game to life and, fingers crossed, unlock a Batman and Catwoman Cash prize or two. Aside from incremental payouts made by aligning items such as Batman's weapons and, of course, the two main characters themselves, you can unlock a bevy of wins with the bonus symbol. Rolling in three of these on reels 1, 3 and 5 will unlock a series of boxes where free spins and multipliers abound. The first part of this in-game bonus is the spins. Choose a mystery box and you'll be given a set number of gratis turns. Once you've done that, a second set of mystery boxes will set your multiplier. After choosing your fate the reels will spin, with any bonus prizes swiftly added to your account once you’ve spun your last. Keep in mind the game’s unique diamond feature: every diamond symbol you roll in during your free spins will turn into a scatter. This selection of scatters will then help to improve your chances of a winning on the next spin by 50%! 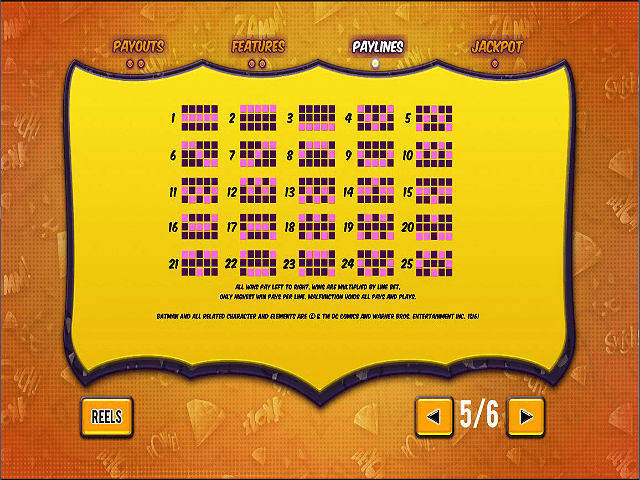 In the spirit of giving you more slot game features, the developers at Playtech have added a second bonus to the mix. Anytime the bonus symbol lands on reels 1 and 3, you'll get the chance to choose a mystery box containing a cash prize or a multiplier. If you find the former, it will be added to your balance instantly. Find the latter and it’ll automatically save, ready for you to use on your next set of free spins. 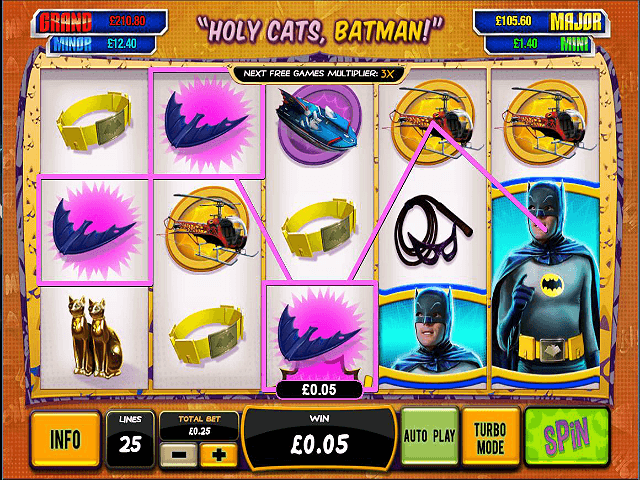 There’s more beyond the bonuses: Batman and Catwoman Cash is taken to a whole new level with its progressive jackpot. It’s link to the DC Jackpot Network means that every player, regardless of the stakes they're playing for, has the chance to win £100,000+. Unlike other jackpot slots that require you to bet a certain amount and align specific symbols, the game's bonus jackpot can strike at any time, and on any spin. Once you're inside the progressive jackpot game, you'll have to match three symbols from a mystery grid in order to win one of four prizes. Prizes range from a few hundred to a few hundred thousand pounds! Share this Batman and Catwoman Cash Review today! 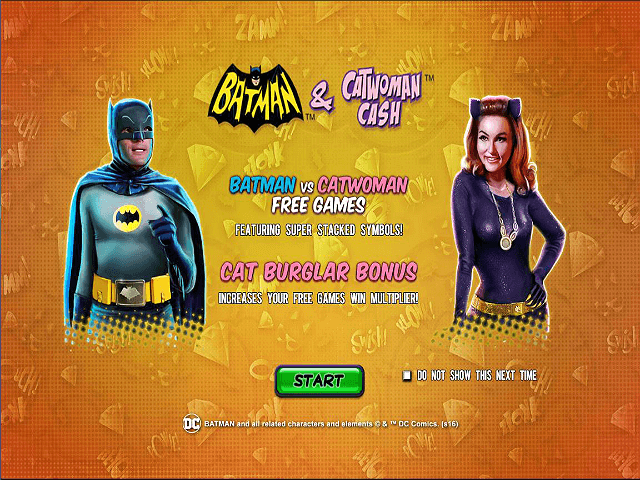 If you like Batman and Catwoman Cash, you'll love these slot titles too!